In our house, we do not do Santa Claus. I have been asked many times why we do not do Santa. It is simple for us. Christmas is about the celebration of Christ’s birth, and we try to keep the focus on what the season is about. Also, the Bible speaks against lying, and there is no way around it but to lie. Santa is too close to the secular view of God. He is a fictional character who you never see, but who seems to know everything about you, even when you’ve been good or bad. He gives good presents if your good, bad presents if your bad. Mommy and Daddy tell you stories about him as if he is real, even though you never see him. What in a child’s mind makes that different than the story of God? God loves them. A child cannot physically see him, and he knows if your good or bad. If Mommy and Daddy lied to me about this person, then why should I believe them when they tell me that, though I cannot see God, he loves me? I have been told many things since we made this decision public, including that my children are being robbed of their childhood. I can assure you that my kids have a wonderful time with Christmas and look forward to it every year! So how do we handle the man in a big red suit that seems to be everywhere :)? We are not anti-Santa ornaments, and I have a lovely piece that is Santa kneeling at the manger, signifying to me that every knee shall bow. We teach the real story of St Nicholas. You can read more about that here St Nicholas History and Activities. We speak about how he used to be a real person, and we commemorate his kind acts of charity today. This year on St Nicholas Day, I will fill their shoes going up the steps with small gifts and treats following the example of the real St Nicholas. We will spend the day doing St Nicholas activities, reading about him, and learning. 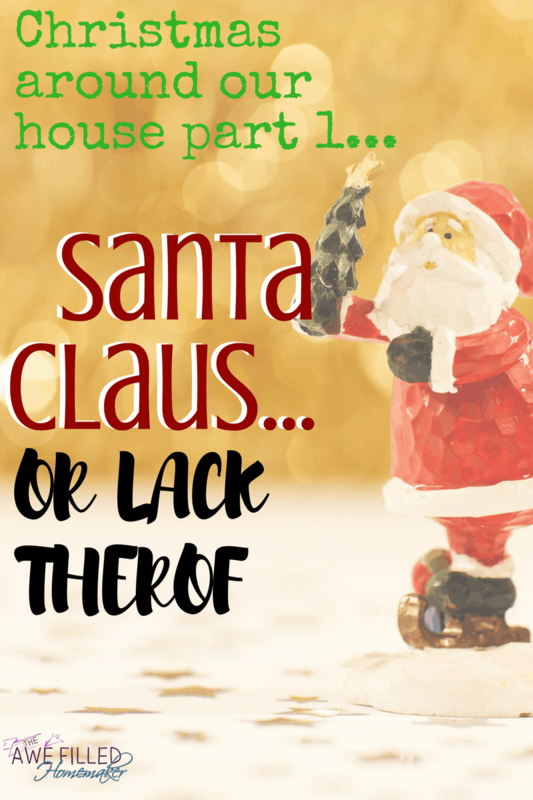 We do talk about how people at other houses do things different and pretend that Santa Claus brings the kids gifts, but we do not tell our kids not to tell other kids the truth. The reason we make this decision is because we are not going to have them lie either. However, we do tell them that unless directly asked they are to not tell others. If they are asked they are allowed to tell the truth. I don’t want them walking up to random kids at Wal-Mart saying things like, Santa isn’t real lol. We allow our kids to sit on his lap, and we allow them to have fun with Santa but that is the extent. We feel it is important always to tell our kids the truth and tricking them does not make Christmas more fun. Also, my husband works hard for our money and Santa Claus does not give him a dime for the gifts. Why should we give credit to someone who isn’t real for his hard work? Also, not all parents use the Santa is watching you line, but many do and honestly this is manipulation. It puts too much focus on gifts, and I don’t believe a parent should have to manipulate their child to get them to have good behavior. I don’t want my kids just to behave for the weeks leading up to Christmas because of gifts they are expecting. We are commanded to train up our children in the way they should go. This isn’t just at Christmas time or for gifts. We want to teach our kids to behave because the Bible tells them to obey their parents and those in authority and to follow God’s word. It should be a heart issue, not a manipulation technique. I know this is a controversial issue but important to us in our house :). Previous Post: « Autism and Making Friends……. We believe and did as you do and our children were fine with this. I could have written what you did with exactly the same reasons. Thank you.